The South Brisbane Cemetery has had many ups and downs since it opened back in 1870, from the proud early years as a grand municipal cemetery to its sad decline during the latter half of the 20th century. At one point it seemed that the cemetery would be allowed to fade away, but it now stands as an important heritage icon and touchstone to our past that is attracting renewed interest from the public and researchers alike. You can discover the history of this wonderful place by exploring the following pages. A look at the overall history of the South Brisbane Cemetery over the decades since the 1860s. Learn about some of the earlier burial grounds in southern Brisbane, including the one underneath what is now a primary school. What is the Real Name of the Cemetery? What is the correct name for this cemetery - South Brisbane or Dutton Park? There has been some confusion on this matter over the years. Why are some 19th-century Brisbane cemeteries segregated into different religious sections, while others are not? Find out here. Read about how interment practices changed over time at South Brisbane Cemetery, with the shift from burial to cremation. Learn about the early-1900s connection between the Bubonic Plague and South Brisbane Cemetery. Learn why the South Brisbane Cemetery was extended to take in new land on its eastern boundary back in 1904. Some of the infrastructure in the South Brisbane Cemetery today dates back to a work scheme for unemployed workers during the Great Depression. Learn how the grass has been short at South Brisbane Cemetery at different times in history. 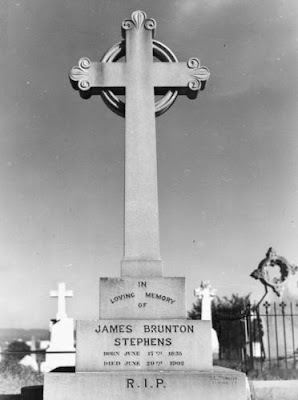 Read about how historic floods affected the South Brisbane Cemetery in the years 1893, 1974 and 2011. Learn about the 1970s 'beautification scheme' plans to gradually remove the headstones and transform the area into a lawn cemetery.